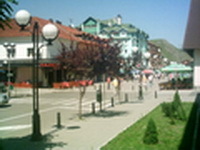 Within the framework of the joint Project of the OSCE and the Union of Municipalities, the team of consultants of the Union of Municipalities has visited the Municipality of Rozaje from 11-14 June 2012. The visit to the Municipality of Montenegro was organized with the aim to assess the implementation of the “Public Ethics Standards in a Local Authority in Montenegro”. This document was prepared with the technical support of the Council of Europe and the financial support of the EU Delegation to Montenegro. The document defines standards of a transparent and accountable local self-government. There are three levels – basic, medium and advanced – within every standard and requirements to be implemented by a local self-government. The team of consultants of the Union of Municipalities consists of: Mrs. Ljubinka Radulović, Assistant to the Secretary General of the Union of Municipalities, Mr. Refik Bojadžić, President of the Municipal Assembly of Bijelo Polje and Mrs. Jovanka Laličić, Chief Administrator of the Municipality of Tivat. The visit included a wide range of activities, such as: workshops and meetings with municipal leadership, elected representatives, local civil servants and employees, representatives of public services established by the State or the Municipality, representatives of citizens, civil and private sectors. The team of consultants will visit the Municipality of Rozaje once more during June when they will presented their recommendations related to the transparency of municipal performance to municipal leadership.